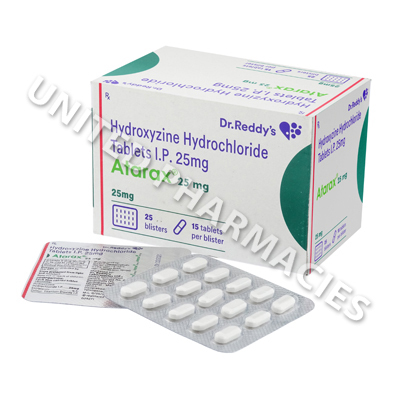 Atarax (Hydroxyzine Hydrochloride) is an antihistamine which can be used to treat itchiness caused by allergies, hives or dermatitis. In addition to the uses listed above, this medicine may be prescribed on a short term basis for treating adult patients affected by anxiety, or to relax patients before surgery. Other uses include treating motion sickness and alcohol withdrawal symptoms. 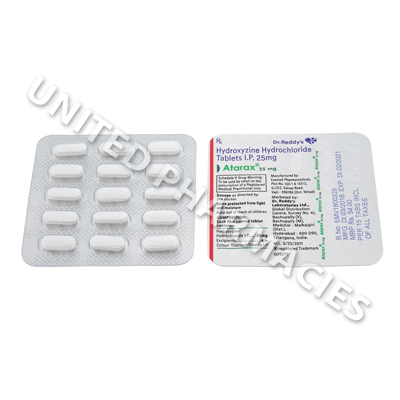 Atarax (Hydroxyzine Hydrochloride) is an antihistamine which can be used to treat itchiness caused by allergies, hives or dermatitis. When used for these purposes, it works by blocking the histamine receptors, which in turn stops itching and other allergy symptoms. In addition to the uses listed above, this medicine may be prescribed on a short term basis for treating adult patients affected by anxiety, or to relax patients before surgery. Other uses include treating motion sickness and alcohol withdrawal symptoms. Atarax (Hydroxyzine Hydrochloride) tablets each contain 25mg of the active ingredient. Patients must visit their doctor before taking the medicine, so that the correct dosage can be determined. It is possible that adults treating anxiety will be prescribed a dosage ranging from 50mg to 100mg, taken 4 times per day. Pruritus (itching) is sometimes treated with 25mg (3 to 4 times per day). Other conditions may require different dosage regimens. Tell your doctor if you experience any side effects during treatment. Although it is uncommon, severe reactions may occur. You will need to seek medical attention straight away if you experience seizures, tremors, weak muscles or any other serious symptoms. If you become drowsy after taking this medicine, you must not drive or operate any dangerous machinery. In addition to this, you may be told by your doctor not to consume alcohol, as this may worsen the side effects of this medicine. Inform your doctor if you are affected by any seizure disorders, kidney disease or liver disease. Always use Atarax (Hydroxyzine Hydrochloride) as you have been prescribed by your doctor. Never self-medicate or change your dosage without first consulting your doctor. The correct dosage can vary depending on your health, medical history, and the severity of the condition being treated.